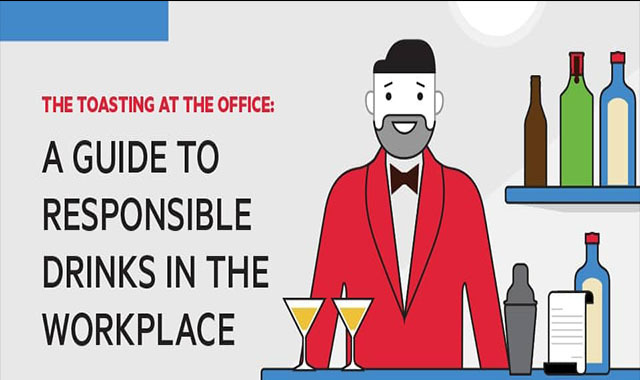 Toasting at The Office: A Guide to Responsible Drinks in the Workplace #infographic ~ Visualistan '+g+"
Yes, work events in the office can safely and responsibly include alcohol. In fact, many HR professionals acknowledge that alcohol can have a place at workplace functions. When employees manage their intake and employers set the right tone and company alcohol policy, wine, beer, cider, or cocktails can be a fun inclusion at holiday parties, team-building exercises, and more. It all starts with solid policy and communication at the organizational level. Companies have an obligation (and often legal duty) to set a corporate alcohol policy so all employees know expectations, limits, and consequences. (See below for specific ideas on what to include in a company alcohol policy, but we recommend consulting your workplace attorney or legal counsel).